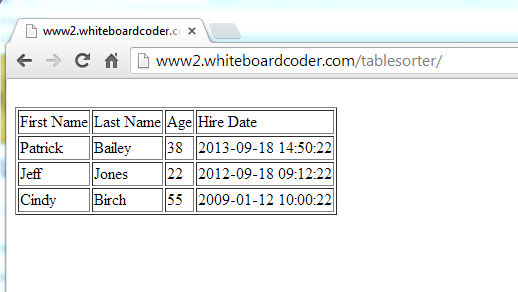 For this simple example I am going to first create a very basic HTML page with a very simple table. This will be served on an nginx web server I am running locally on my network. Here is the code for my simple HTML page. I want to add the tablesorter tool to this so I can have an interactive table. I downloaded and installed the tablesorter code in a folder called js at the base of my website directory tree. This download includes jquery.tablesorter.js and the jquery-latest.js. Make sure you can access these files via the web. The table is in the order it was created, but now if you click on a column header it will sort by that column. This references the blue style that is given by the tablesorter people. Tablesorter has 2 themes, blue and green. I like the blue personally, Or I suppose you could roll your own css files if you want to. This css file applies to the tablesorter class. The cells in the header need to be enclosed by <th> not by the <td> tag. If you want to only sort a certain table give it an id and sort on that id. Here is an example of my code updated to do this. You can set a default sort order. The following will sort the 2nd column first in an ascending order then the 3rd column in an ascending order. The Last Name is already sorted in order. This will order by the second column in reverse order.